Peter Zneimer is a trial attorney who practices in the area of personal injury and litigation. 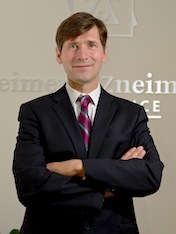 Mr. Zneimer has over twenty years of experience as a litigation attorney and has represented hundreds of clients throughout Illinois before the state and federal courts. Peter Zneimer has prosecuted claims on behalf of persons injured as a result of motor vehicle collisions, fall down accidents, injuries due to unsafe products, and claims arising out of discrimination. Peter Zneimer holds a J.D. from Indiana University School of Law, and a Bachelor Degree in Political Science from Indiana University. He has extensive trial experience in personal injury and other civil law cases.